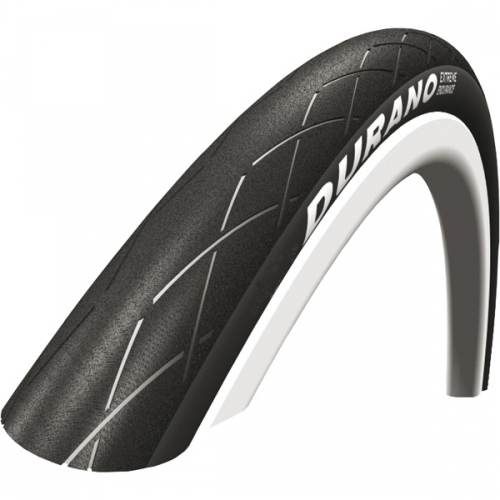 One of the fastest tyres available, the Durano is also long lasting, has good grip and benefits from "RaceGuard" puncture protection. Due to availability in the 559 size, it's useable on many recumbent and mountain bikes as well as on racing bikes. Due to the range of different widths you can achieve a more comfortable ride than with a narrower tyre, while still benefitting from the high performance of the Durano. While a narrow tyre on the front of a racing bike makes a significant difference due to aerodynamics, it can be combined with a wider tyre at the rear for more comfort and better rolling resistance while not significantly affecting aerodynamics. Also note the special versions of the Durano now available. The Durano S is the true follower for the discontinued Stelvio - being lighter and faster than a normal Durano. The Durano T is a special version including an inner tube which is vulkanized into the tyre for maximum performance, and the Durano Plus incorporates some of the anti-leak protection from other Schwalbe tyres in to a road bike tyre. For durable performance in the winter, this is an attractive tyre. Consider also the Continental Grand Prix, the Schwalbe Kojak and Continental Contact Speed.